RealityAired.com will give away t-shirts and hats to two random lucky fans. RealityAired.com is excited to announce another fan giveaway featuring long fitted tanks and hats from 'Mob Wives' star Drita D’Avanzo’s collection. Entrants must be 18 years of age and have a US mailing address. Only one entry per valid email address and/or household. Deadline for entry is April 6, 2012 (6pm EST). To be considered, fans can submit official entries at RealityAired.com’s Facebook page. Two winners will be selected at random. 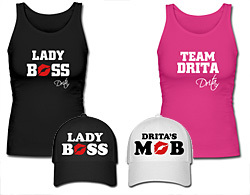 Drita’s T-Shirts, pants and hats feature well-known lines, such as ‘Lady Boss’, ‘Team Drita’, 'Drita's Mob' and ‘I Will Go to War for my Family,’ from the hit show ‘Mob Wives’. RealityAired.com has up to the minute information (24/7), news, photos, videos and recaps on some of the most popular reality TV shows on air today. From the Jersey Shore to The Real Housewives, RealityAired.com covers everything that is need- to- know for reality TV viewers and addicts alike. Valdez Media, Inc. was founded in early 2011. Valdez Media aims to create a network of entertainment avenues for a variety of audiences that cover television, film, sports, music and fashion. Valdez Media, Inc. is based out of the Washington D.C.